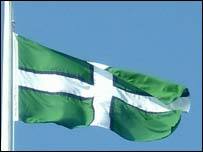 People in Devon and Cornwall will be able to fly their county flags without planning permission. There had been anger at the suggestion that consent was required before flags could be flown. But the Minister for Housing, Keith Hill, has now said local authorities can officially "turn a blind eye" to the practice. 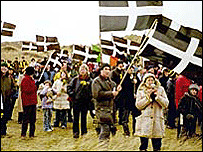 Cornwall has the black and white flag of St Piran, while the Devon flag was designed for the BBC Devon website. The MP for North Cornwall, Paul Tyler, who sought clarification from the government, says the decision represents a victory for the people of Devon and Cornwall and their flags. In April, Rodney Lock of Ottery St Mary in Devon was threatened with legal action for flying a Devon flag in his back garden. He faced a £60 charge to get planning permission from East Devon District Council. National flags are exempt from planning permission under current legislation. But Keith Hill has confirmed that it is up to the local district or borough council whether they allow the county flags to be flown or take enforcement action.